Be the first to share your favorite memory, photo or story of Edna . This memorial page is dedicated for family, friends and future generations to celebrate the life of their loved one. 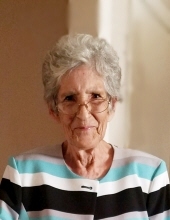 Mrs. Edna Smith Beasley, 79, of Erwin died Wednesday, November 14, 2018 at Transitions LifeCare Hospice in Raleigh. Mrs. Beasley was born April 12, 1939 in Duplin County daughter of the late Henry J. and Effie L. Jones Smith. She was also preceded in death by her husband, Roland Beasley and sons, Kenny and Billy Wallace. A funeral service will be held 2 p.m. Sunday, November 18, 2018 at Skinner & Smith Funeral Home Chapel with Rev. Billy Nowell officiating. Burial will follow at Greenwood Cemetery. Mrs. Beasley is survived by her grandchildren, Crystal Franklin and husband Bert of Lillington, Dustin Wallace and wife Amber of Erwin; great grandchildren, Tucker and Colby Sturtz, Landon and Chase Wallace; step grandchildren, Rochelle Weeks and husband Nick of Erwin, Precious Bond of Erwin; step great grandchildren, Davenee Weeks of Coats and Ava Mendez and Axi Scott both of Erwin; daughter-in-law, Michelle Wallace of Erwin; sister, Marie Parson and husband David of Dunn; brothers, James Smith and wife Phebie of Erwin, Carl Smith and wife Elaine of Erwin; and several nieces and nephews. The family will receive friends 6-8 p.m. Saturday at the funeral home and other times at the home. Memorials may be made to Transitions LifeCare, 250 Hospice Circle, Raleigh, NC 27607. To send flowers or a remembrance gift to the family of Edna Smith Beasley, please visit our Tribute Store. "Email Address" would like to share the life celebration of Edna Smith Beasley. Click on the "link" to go to share a favorite memory or leave a condolence message for the family.